Falcon Energy offer customers a complete sound insulation testing service that is in-line and fully compliant with the Building Regulations Document E 'Resistance to the Passage of Sound' across Sussex, Surrey, Kent and surrounding counties. Why is Sound Insulation Testing necessary? To be compliant with Part E of the Building Regulations, Sound Insulation Testing must be carried out at all residential or commercial new build properties pre-completion to ensure the development demonstrates acceptable levels of sound insulation. It's vital that such tests are carried out by an experienced professional, like Falcon Energy, to ensure all boxes are ticked and all guidelines met. Carrying out thorough and professional airborne and impact testing procedures, our experienced and qualified UKAS Engineers will determine the quantity of tests needed for your property. This will be based on the layout of the build, how many dwellings you have and any separating walls or floor. The expert team at Falcon Energy will carry out all Sound Insulation Testing quickly and efficiently, with little impact on your building schedule or onsite contractors. We'll work hard to avoid disruption and ensure the job is completed in good time and with minimal upheaval; causing added stress is the last thing we'll do. We're highly skilled at identifying the exact type and number of tests that your property will need and we will always try to keep costs low and deadlines in mind. Our team are known for their professional nature and hardworking attitude with no job too big or small for us. Our Sound Insulation Testing services cover the nation and we can work on any property, no matter the size, location or layout. Why should you choose a UKAS accredited company? UKAS is a national accreditation body recognised by the UK Government and ensures the team working on your site or property are fully qualified and capable of performing accurate sound insulation testing. 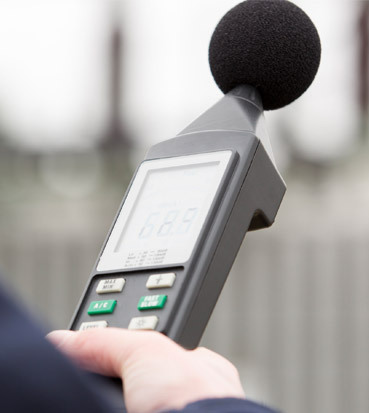 At Falcon Energy, our team members are fully accredited by UKAS for sound insulation testing. This ensures you can contact us in confidence and means that any resulting certification is official and will be recognised by the relevant Building Control Officer. A site is ready for testing just before completion of the build, when doors, windows, trickle vents and power is fitted on site. This allows the readings to be more accurate and provides us with the quiet environment necessary for the tests to be undertaken, as any additional noise from building work would most likely affect the results. We have a highly skilled, efficient team who will complete testing and issue a detailed report of certification to meet your own deadlines. Typically, we are able to release certification within two days of testing. What happens if a test shows sound insulation fails to meet standards? In the event that a test results in a ‘fail’, it is still fully payable to our team. We recommend that if possible, we are contacted before a build to provide a design review and advice on how to meet quality standards. Should the test fail, we offer free advice on how to improve sound insulation and discounted retest fees. It requires all residential buildings to be tested when they involve walls and/or floors. These are known as party elements. All new-build or converted residential properties in the UK fall under this regulation, with a minimum sample of 10% of properties requiring sound insulation testing. Give our team a call on 01403 253439 or email info@falconenergy.co.uk and we'll be happy to offer a free, no obligation quote. Alternatively, get in touch for expert advice and to see how we can help.